Nebraska improved to 12-0 all-time against FCS opponents (at game time) and picked up its first win over an FCS foe since a 2014 victory over McNeese State. Nebraska sophomore JD Spielman had a 77-yard punt return for a touchdown in the first quarter. The punt return for a touchdown was Nebraska’s first since De’Mornay Pierson-El returned a punt for a touchdown at Iowa in 2014. The 77-yard return is Nebraska’s longest since an 80-yard return by Pierson-El against Iowa in 2014. Spielman had a kickoff return for a touchdown last season vs. Arkansas State. He is the first player to return a kickoff and punt for a touchdown in his career since Ameer Abdullah (KOR vs. Fresno State, 2011; PR vs. Idaho State, 2012). Spielman caught five passes for 72 yards in the game. In the process Spielman moved into the top 10 in career receiving yardage at 1,516 yards. In today’s game he broke a tie with Maurice Purify (1,444) and passed Matt Davison (1,456) to move up to 10th place. With his five catches, Spielman moved up to a tie for ninth place with Todd Peterson with 108 career receptions. Spielman has 53 receptions this season, after recording 55 catches in 2017. He is only the third player in school history to post two 50-catch seasons, joining Johnny Rodgers (1971 & 1972) and Kenny Bell (2012 & 2013). In addition to his 77-yard punt return, Spielman had a 40-yard reception in the first half. He now has 10 career plays of at least 40 yards, including five receptions, three kickoff returns, one rush and today’s punt return. Senior receiver Stanley Morgan Jr. caught seven passes for 82 yards, all in the first half, including first-quarter touchdowns of 3 and 27 yards. It marked the second straight game Morgan has had two touchdown catches and gives him 20 career touchdown receptions. Morgan is the fourth player in Nebraska history with 20 career touchdown catches, joining Johnny Rodgers (25), Nate Swift (22) and Kenny Bell (21). Morgan increased his career receptions total to 163 moving him within 18 receptions of the Nebraska school record of 181 catches by Kenny Bell. Morgan currently sits in fourth on that chart, also trailing Jordan Westerkamp (167) and Nate Swift (166). Morgan has caught at least one pass in 34 straight games, three shy of the NU school record and he has at least three receptions in 19 of the past 20 games. Running back Devine Ozigbo rushed 11 times for 110 yards, including a 14-yard touchdown to open the scoring. Ozigbo did not play in the second half. It marked the fourth time in the past five games Ozigbo has topped 100 yards, and his seventh career 100-yard rushing game. Quarterback Adrian Martinez completed 15-of-22 passes for 213 yards and two touchdowns. Martinez increased his season total to 1,656 passing yards, setting a Nebraska freshman record. The previous record was 1,632 yards by Taylor Martinez in 2010. Martinez accounted for 206 yards of total offense to post the 26th, 2,000-yard total offense season in school history and just the second by a freshman, joining Taylor Martinez in 2010. Cornerback Dicaprio Bootle had one pass breakup, giving him 14 this season and moving him into a tie for fourth place on the season PBU list (15 is tie for 2nd). He is three breakups from DeJuan Groce’s school record 17 pass breakups in 2000. Defensive lineman Peyton Newell had an interception in the second quarter, the first of his career. It was the first interception by a Nebraska defensive lineman since defensive ends Randy Gregory, Jason Ankrah and Avery Moss each had an interception in 2013. It was the first interception by an interior defensive lineman since Terrence Moore had an interception at Michigan in 2011. Linebacker Mohamed Barry had game-high 11 tackles, marking his fifth double-figure tackle game and the seventh time this season he has had at least eight tackles, including each of the past six games. Barry tied his career high with three tackles for loss, including a sack. Senior Luke Gifford had a 21-yard sack in the third quarter, increasing his team-leading sack total to 5.5 sacks. Tight end Jack Stoll had a career-long 37-yard reception in the second quarter. Punter Isaac Armstrong had a 73-yard punt in the third quarter, tying for the seventh-longest punt in school history. It is the longest punt by a Husker since Alex Henery had a 76-yard punt at Virginia Tech in 2009. Safety Deontai Williams had two takeaways, recovering a fumble in the second quarter and picking off a BCU pass in the third quarter. 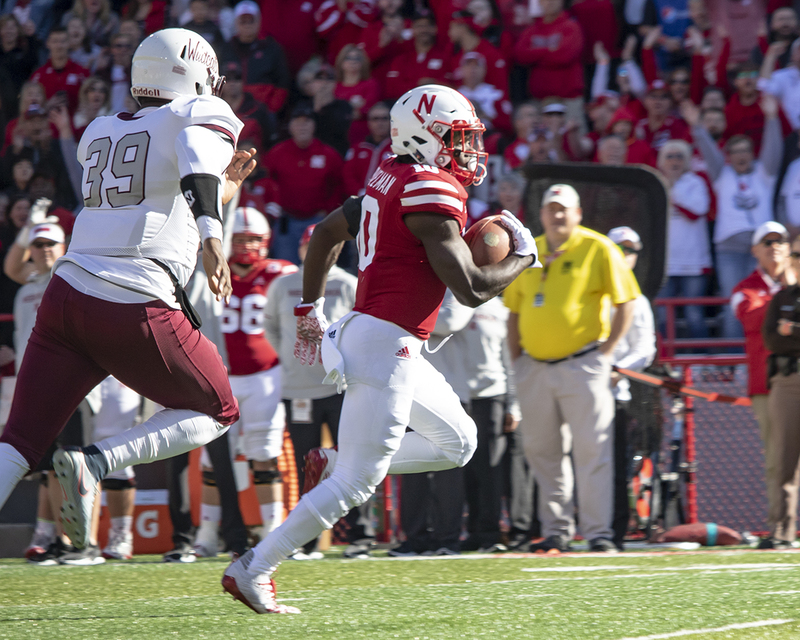 Nebraska’s three takeaways were a season high, topping its two takeaways against both Troy and Northwestern.